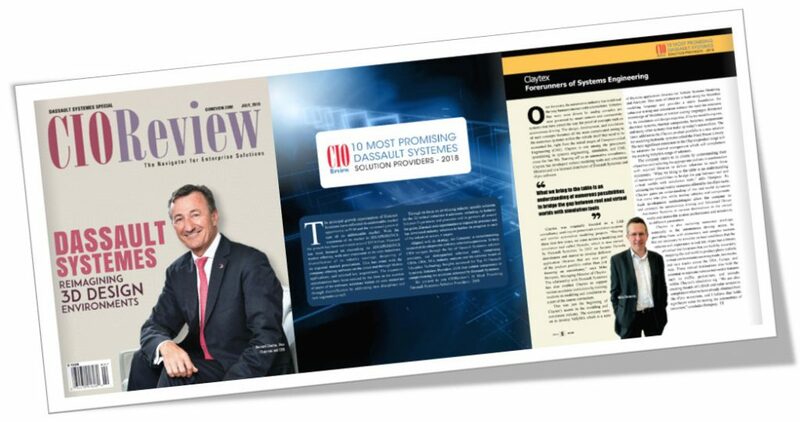 CIOReview, a published magazine for technology solutions, have announced Claytex as one of the 10 Most Promising Dassault Systèmes Solution Providers of 2018. To help CIOs navigate through the list of Dassault Systemes solution providers, their distinguished selection panel, comprising CEOs, CIOs, VCs, industry analysts and editorial board of Education Technology Insights narrowed the Top 10 Dassault Systemes Solution Providers 2018 that exhibit competence in complementing the solutions delivered by Dassault Systemes. The magazine stands out with its learn-from-your-peers approach which helps the CIOs and other technology buyers to make wise decisions from the wide range of choices available in the tech-arena. Managing Director of Claytex was interviewed by the CIOReview journalist. Claytex was originally founded as a CAE consultancy working on powertrain simulation systems and similar automotive modeling projects. In 2003 we became Dymola distributors and started to develop different application libraries that are now part of the product portfolio rather than just focusing on consultancy,” says Mike Dempsey, Managing Director of Claytex. This was just the beginning of Claytex’s ascent in the modeling and simulation industry. The company went on to develop VeSyMA which is a suite of Dymola application libraries for Vehicle Systems Modeling and Analysis.